You taste and drink beverages every day as they pass through your mouth. However, when it comes to wine, tasting and drinking are very different. Compared to other beverages wine has a more complex structure and taste. Most wines have a lot of different subtle flavors at the same time. For example, they can be soft and sharp simultaneously. If you drink wine in the same way you drink milk or juice, you are missing a lot of sensations and flavor nuances. First and foremost, you want to take your time. The more attention you pay to the wine, the more discoveries about the taste you will have. Wine tasting is a process that consists of three steps. The first two steps don’t have to do anything with your mouth. They include looking at the wine and smelling it. Looking at the wine in a glass will allow you to see how it reflects the light and which shade of red it is. To enjoy the appearance of wine, tilt a half-full glass and look at the wine against a light background. Notice its color and how pale or how dark it is. With time and experience, you will begin to notice different patterns, such as deeper colors in younger wines. You can also swirl the wine in your glass to observe how it runs back down on the walls of the glass. Some wines create legs that slowly flow down. At a certain point of time, they were considered to be a sign of a high-quality wine. After you take your time observing wine’s appearance, it is time to start smelling the wine. To get the most out of the smelling experience, start with swirling the wine in the glass. However, don’t do this if you glass if more than half full or you’ll risk spilling the wine. Keep your wine glass on the table and move it three or four times in a circular motion so that the wine inside starts swirling and mixing with air. After that bring the glass to your nose and enjoy the aroma of the wine. The options here are endless. It can be mild or intense, fruity or woodsy and so on. Your sense of smell will tire quickly, but it will recover quickly, too. Wait a few moments and then repeat. What you smell should be a pleasurable experience and you should have a good time in the process. 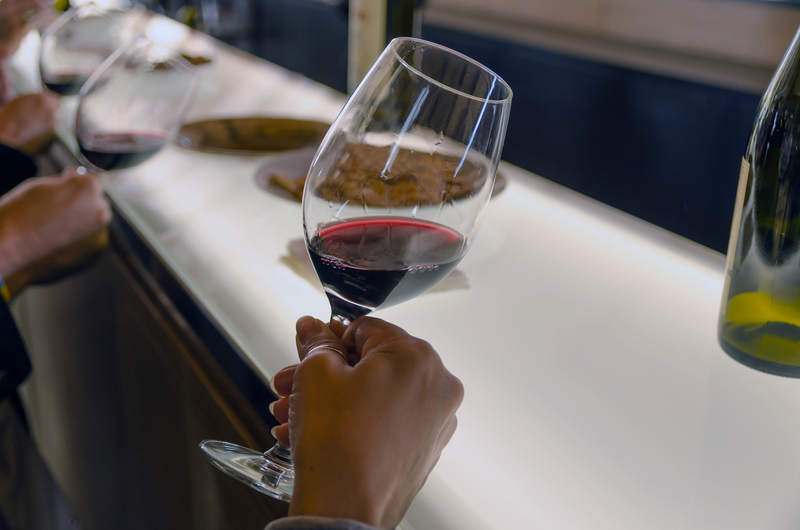 Even if you don’t enjoy certain smells of some wines, you’ll get to know what makes the wines from certain countries and regions different from others. Some people are concerned with the fact that they will not be able to identify as many flavors and aromas when smelling wines. Just like with many other things in life, this is a matter of practice, experience, and attention. After you are done with looking at the wine and smelling it, you can move to finally tasting it. Take a sip of a medium size. Hold the wine in your mouth for a little bit. Move it around in your mouth as if you were trying to chew it, then swallow. This process usually takes several seconds. Don’t be afraid to take your time. Our taste buds that are located on the tongue can identify various sensations known as basic tastes. They are saltiness, sweetness, bitterness, sourness, and umami, a savory feature. With wine, you will most often experience sweet, sour and bitter sensations. Moving the wine around in your mouth allows you to make sure it touches all your taste buds for a fuller experience. It also allows your brain to process the taste and make some sense out of it.